The Focke-Wulf Fw 189 was designed in response to the German Air Ministry specification issued in February 1937. This called for an aircraft with a crew of three and better performance than the Hs 126, then about to enter service as the standard reconnaissance aircraft. 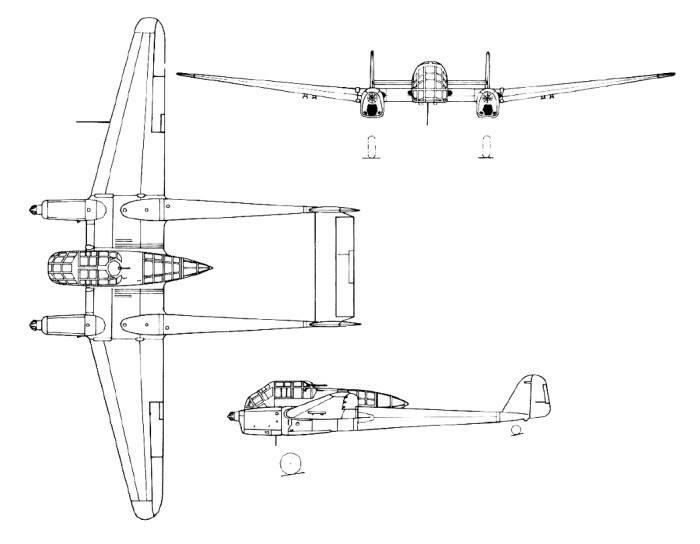 Arado, Blohm und Voss and Focke Wulf each produced a design in response to this specification. To meet this specification, Focke Wulf's team under the leadership of Kurt Tank evolved a twin boom design. A 430 hp Argus As 410 12-cylinder air cooled inverted V type engine was installed at the front of each slender tail boom, driving a two blade propeller, and mounted on the centre section of the wing, between the booms, was an extremely well glazed nacelle accommodating the three man crew. Each tail boom terminated in a single fin and rudder, bridged by a centrally mounted tailplane. The first prototype, the Fw 189 V1 (registration D-OPVN), made its maiden flight in July 1938. No armament was fitted to the Fw 189 V1, but the second prototype (D-OVHD), which flew in August 1938, was armed with a 7.9 mm (0.311 in) MG 17 machine gun in each wing root and three 7.9 mm MG 15 guns: one each in the nose, a dorsal blister, and the tailcone of the nacelle. The V3 (D-ORMH) was unarmed, but had the definitive 450 hp As 410-1A engines intended for production aircraft and automatic variable pitch propellers. The success of the first three prototypes was rewarded with an order for a second series of four prototypes. The Fw 189 V4 fourth prototype was representative of the Fw 189A production configuration, but it was actually the Fw 189B, based on the V5, that was first to be ordered into production by the RLM in 1939. V4 had modified engine cowling, semi-cowled main wheels, a larger main wheels and only two machine guns. The wing root guns remained, as did the upper and rear pod guns, although the front gun was removed. The V4 was used for tests with smoke-screen equipment and with equipment for using poisoned gas and chemical weapons. V5 was the prototype for the B series of training aircraft. V6 was the prototype for the planned series of heavily armoured ground attack aircraft and V7 was to be built as a prototype of a twin-float version of the aircraft, although it was completed as one of three B-0 trainers.The Fw 189B (three B-0s and ten B-1s) was built as an unarmed, dual control five seat trainer, its modified nacelle lacking the nose and tailcone glazing of the A series prototypes. Production of the Fw 189A finally got under way in the spring of 1940, a batch of ten pre-production Fw 189A-0s for service trials being followed by the first series version, the Fw 189A-1. In the spring of 1940 Focke-Wulfe received an order for ten pre-production A-0s and twenty A-1s. The A-1 was armed with two fixed forward firing MG 17s and two flexibly mounted MG 15s. The first of these was carried in a circular glass turret on the roof of the cockpit, while the second was mounted in the conical rear cone of the pod, which could rotate through 360 degrees. The A-1 could also carry four 154lb/ 75kg bombs and an RB 20/30 camera as standard, with a wide range of other cameras available. Large scale production didn't get under way until late in 1940. This began to reach Luftwaffe units in late 1940 and early 1941, and eventually equipped at least nine Aufklarungsgruppen (long range reconnaissance wings) and 15 Nahaufklarungsgruppen (short range reconnaissance wings), most of them on the Eastern Front. Known variously as the Uhu (owl), or as das Fliegende Auge (the flying eye) of the Wehrmacht. Production Fw 189A-1s carried an armament similar to that of the second prototype, except that the nose machine gun was deleted. The second production version, the Fw 189A 2, differed in having 7.9 mm (0.311 in) MG 81Z (twin MG 81) guns in the dorsal and tailcone positions, instead of the MG 15s. The Fw 189A4 (the Fw 189A-3 was an unarmed trainer) was a ground support development of the A-2, having ventral armour plating and 20 mm (0.79 in) MG FF cannon instead of MG 17s in the wing roots. All except the A- 3 could carry four 50 kg (110 lb) bombs on racks under the outer wings. The Fw 189A-1/Trop was a hot climate version for service in the Mediterranean and North African theatres; the A-1/U2 and A-1/U3 were two special one off conversions for a VIP transport role; the single Fw 189E was another A-1, converted to 700 hp French Gnome Rhone 14M radial engines; and many A types were, in their later years, used for such secondary duties as liaison and casualty evacuation. Some even had a short spell as night fighters with I/NJG 100. A number of were purpose-built five-seat trainers. The Fw 189 was given a high production priority and was produced at several factories across Europe, with new production lines being established in Prague and around Bordeaux although production began at Focke-Wulf's own factory at Bremen. The type became the main German tactical reconnaissance aircraft from 1942 until the summer of 1944. Thirty eight aircraft were delivered by the end of 1940, sixty-one in 1941, fifty seven in 1942 and eleven in 1943. By this point production was being concentrated around Bordeaux, while the Bremen factory was focusing on the Fw 190. The second production line was in the Aero-Avia factory at Prague. This factory produced 151 aircraft in 1940-41, 183 in 1942 and three in 1943, for a total of 337. The final production line was set up around Bordeaux. At first the French factories assembled aircraft from German-built sub-assemblies, completing 87 aircraft in 1942. In 1943 the French factories were responsible for most remaining aircraft, before production of the Fw 189 was cancelled early in 1944. Eventually 864 Fw 189s were completed, 337 at Prague, between 250 and 300 in France (sources differ, and sub-totals often don't add up), and the rest at Bremen. Production reached its peak in 1942. At the start of the war German short range reconnaissance was carried out by squadrons designated as Aufklärungsstaffeln (Heer), abbreviated to Aufkl. (H) or (H). Thirty six such squadrons existed in August 1939, and were under army control. Each squadron was self-supporting and fully mobile and could move from location to location under its own steam. The first few Fw 189s reached experimental sections of the Luftwaffe in the spring of 1940. At about the same time some aircraft reached the reconnaissance squadrons for service trials, but large-scale deliveries didn't really begin until the end of 1942. On 22 July 1941, at the start of the invasion of the Soviet Union, the number of reconnaissance squadrons had risen to 54, most of which were still using the Hs 126. Production of the Fw 189 increased in pace during the year, but even at the end of 1942 the Hs 126 still made up a significant proportion of the available aircraft. In the winter of 1941-42 the squadrons were organised into short-range reconnaissance groups, each of which was meant to contain three squadrons. On the southern sector there were nine groups with sixteen squadrons, of which six were still using the Hs 126. In the middle sector things were worse, with six groups and thirteen squadrons, of which nine still had the Hs 126. Finally both squadrons operating in the north were still using the older aircraft. Of a total of 31 short-range reconnaissance squadrons, 17, or just over half, were still using the older aircraft. By the summer of 1944 the Fw 189 had been forced out of the daytime skies, and the surviving aircraft were forced to operate at night, or as training and liaison. In April 1937 Focke-Wulf received a contract to produce a single prototype, which made its maiden flight in July 1938 and it was this prototype that was evaluated by the Ilmavoimat / Maavoimat / VL team in August of the same year. The Ilmavoimat viewed the Fw 189 as a rugged and simple aircraft to be used solely for short-range tactical reconnaissance and coordinating close air support and artillery strikes with forward ground operations. The intention was to operate the aircraft from rough forward air bases and for the aircraft to have a higher maximum speed than the Fi 156. It was also intended that the aircraft be used for front-line low-level reconnaissance and aerial photography. This aircraft had rated very highly in the evaluations, with excellent all-round visibility, good stability and responsiveness and able to maintain steady flight on one engine as well as being exceptionally agile and strongly constructed. 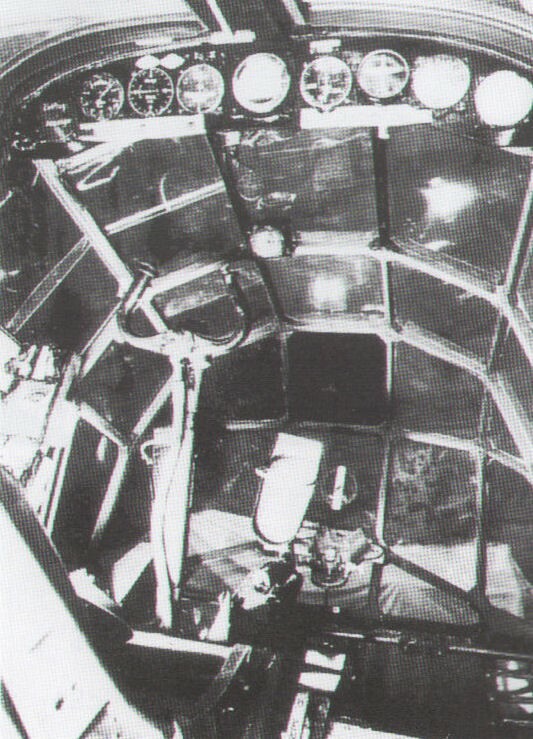 The layout and positioning of navigational equipment and radios was carefully thought out, cockpit heating was efficient and it was easy to put the aircraft on target when laying down marker bombs. The Ilmavoimat ordered twenty of the Focke Wulf Fw 189’s. There were some design modifications specified. The pilot and observer/controller were to sit side by side, making communications easy. Armour was added under the fuselage and engines and self-sealing fuel tanks were specified. Armament consisted of two machine guns on a flexible mount in a dorsal position and four fixed machine guns in the wing roots, firing forwards. After delivery, two Hispano-Suiza 404 20mm cannon were fitted in a blister beneath the fuselage. The rear gunner position of the German-version was eliminated to reduce weight and rather than 4 hardpoints for 50kg bombs, 8 hardpoints for 30kg phosphorus marker bombs were fitted. The aircraft was just entering production in Germany and with ther German eager for hard currency, the Ilmavoimat got the first twenty aircraft of the German production lines, perhaps unfortunately as Focke Wulf used these to iron out some of their initial production line problems. Despite this, the Ilmavoimat found the Fw 189’s to be a superb front line reconnaissance aircraft, tough and durable, able to take a lot of damage and maneuverable enough to stay out of trouble even if caught on it’s own. The Ilmavoimat’s Fw 189’s were delivered in February 1939, much to the relief of the High Command, who were unsure which orders that had been placed would actually be fulfilled up until the moment that the aircraft actually arrived in Finland. To this end, after the Munich Crisis, and as part of Finland’s emergenmcy measures, it was specified that wherever possible, Finnish military equipment purchases would be carried on Finnish cargo ships wherever feasible, even if this meant additional shipping costs. After the Munich Crisis, as Finland experienced what would in later years be called “The Great Awakening,” a wide range of emergency measures were put in place and additional emergency funding for military equipment was provided. Among this funding was provision for a further twenty Fw 189’s. These were ordered in December 1939 and to the relief of the Ilmavoimat, actually delivered in May 1939. With tensions increasing with the Soviet Union, a further order was placed for forty Fw 189’s in July 1939, but this was cancelled by the German government on the 19th of August 1939, shortly after Molotov Ribbentrop Pact was signed. Slovakia, a nominally independent republic which came into being following the Nazi dismemberment of Czechoslovakia, received 14 Fw 189A and Hungary about 30 A-2s. Production ended in August 1944, by which time a total of 864 Fw 189s had been completed. Of these, 310 were produced by the SNCA du Sud Ouest at Bordeaux Merignac during 1942 44 and 337 Fw 189As by the Aero factory in Czechoslovakia between 1941 43. The French total comprised 293 Fw 189As plus 17 examples of the Fw 189F 1, a version of the A 2 with 580 hp Argus As 411MA- 1 engines. Focke Wulfs total of 217 included six prototypes, 198 Fw 189As and 13 Fw 189Bs. The sixth prototype (V6) and modified first prototype (Vlb) were used flight test a very much smaller, well armoured two seat nacelle intended for the proposed Fw 189C assault version: other projects that did not come to fruition were the twin float Fw 189D and the 950 hp 402 engined Fw 189G. Armament: 2x MG 15 7,92mm, 2x MG 17 7,92mm, 4x 50kg Bomb. Engines: 2 x Argus As.410 A-1, 347kW / 459 hp. Gross weight: 3950 kg (8710 lb).